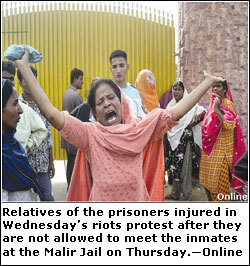 Lahore: The Human Rights Commission of Pakistan (HRCP) has expressed serious concern at recent incidents of prison unrest in the country and asked the government to undertake urgent prison reform instead of depending on short-term measures. In a statement issued on Friday, HRCP said: “The recent rioting in prisons of Hyderabad, Karachi, Multan and Timergara and the loss of life there is tragic but unfortunately not unexpected. These incidents are a result of problems left unresolved for decades. The issue is certainly bigger than prison riots or attempted jailbreaks alone. Appalling overcrowding, rampant corruption, torture, unhygienic food, lack of health facilities and staff training, tardy judicial process, inefficient investigation and prosecution are all key issues that have not been addressed and cannot be wished away. Numerous committees set up in the past 20 years for prison reform have danced around these issues without meaningfully tackling them. Many useful proposals advanced by them have been ignored. Measures such as suspending jail officials, registering cases against prisoners accused of rioting, and shifting detainees to other jails to avoid recurrence skirt the real issue. Reported torture and beating of prisoners following the riots is no solution, nor is providing police more teargas shells and smoke bombs, as is being considered following the riot in the Hyderabad jail. According to the jail surgeon, the prisoners shot dead during rioting at Karachi’s Malir District Jail by guards had all been shot in the head or chest. This is hardly the ideal method for riot control or a use of minimum force needed to quell the rioting and points to deficient training for jail staff at the very least. The top leadership of the country is aware of the problems facing the prison system as they too have served extended jail terms. They have also suggested immediate remedial measures, which must be implemented. Prisoners’ rights, including their right to life and dignity, must be observed in all circumstances and their safety ensured. Punishments other than penal servitude should also be considered, especially for petty crimes, to reduce population of jails already holding prisoners many times over their capacity. Prisoners must also be allowed communication with their family and lawyers via phone, at least under supervision. The criminal justice system needs to be reviewed and an adequate number of judicial officers ensured to tackle undue delay in deciding cases. The approach toward the prison system needs to be changed — the prisoner and the jailer both need to be humanised and terms of service of jail staff improved. A change in the Code of Criminal Procedure in October 2001 took away a provision regarding mandatory bail to prisoners whose trial had not begun for two years. This was presumably done to deny the provision’s benefit to political prisoners, but has led to massive swelling in the prison population. Lahore: The Human Rights Commission of Pakistan has called upon the government to end the death penalty in the country, and place an immediate moratorium on executions until the punishment is abolished. In a statement issued on World Day against the Death Penalty on Friday, the Commission said: The government of Pakistan should seriously consider moving towards the abolition of death penalty. While the government’s announcement in June to commute death sentences to life imprisonment was admirable, it has not been followed up by action. The pronouncement of punishment and executions continue in Pakistan amid the acknowledged and well documented critical defects of the law, of the administration of justice, of the police investigation methods, the chronic corruption and the cultural prejudices affecting women and religious minorities. In the circumstances, the punishment allows for a high probability of miscarriages of justice, which is wholly unacceptable in any civilised society, but even more so when the punishment is irreversible. The HRCP notes that, contrary to the much vaunted argument of deterrence, the systematic and generalised application of death penalty has not led to an improvement of the situation of law and order in the country. It is ironic that while Pakistan has one of the highest rates of conviction to capital punishment in the world – with around 7,000 convicts on the death row in Pakistan today – yet its law and order situation is alarmingly dismal. The massive application of death penalty has not strengthened the rule of law, but its application has, much on the contrary, weakened it substantially. The death penalty is discriminatory, unfair and utterly inefficient and must be abandoned in accordance with the international human rights law. In the very least the government should also promptly restrict the number of offences carrying the death sentence to the most serious crimes only, and refrain from adopting new crimes entailing capital punishment, in conformity with international human rights standards. Imposition of capital punishment, if it is to be passed at all must be in the rarest of cases and execution of it as a measure of last resort. In the meanwhile, the government must adopt an immediate moratorium on executions in light of the serious shortcomings of due process and fair trial in the criminal justice system. There is a serious danger of miscarriage of justice resulting in taking an innocent life if executions are carried out without serious review of the law and its practice. It is vital that the criminal legal system be thoroughly reformed to reduce the incidence of crimes and to ensure that wrong persons do not suffer through being implicated falsely in cases. This alone will bring us closer to achieving justice. There must also be an immediate end to the sentencing and execution of minors, and death sentences pronounced against persons who were below 18 at the time of the offence should be forthwith commuted. Pakistan must take the path of conforming its practices to international human rights norms. So far it has only challenged these at all forums. Human Rights Commission of Pakistan strongly appeals to President of Pakistan to revoke hanging of Zulfiqar Ali in Adyala Jail Rawalpindi who’s Red Warrants were issued for his hanging on 8th October, 2008. Zulfiqar Ali is in Jail since 1998 on charge of murder. He was very poor to afford a lawyer to defend himself and did not had a chance of fair trial and basic norms of justice. It is reported that wife of Zulfiqar Ali died of Cancer during his trial and has left two minor girls and no one is to look after them. As recently announced by the Prime Minister of Pakistan that death sentences would be abolished, HRCP reminds and urges that death sentence should be abolished.